The holiday season is almost here! This cute custom DIY treat jar can be created in mere minutes using inexpensive materials with no special skills or tools required. It’s so easy! Why not make one for your precious pets or create a whole batch as holiday gift jars for special animal-loving family and friends? To create your own, you will need a lidded jar and alphabet stickers. Masking tape and/or scissors may also be handy, depending on your layout. Any clean glass jar with a well-fitting lid will work for this project, including budget-friendly bargain buys (like mine) or simple upcycled jars. If you have a cutting machine, custom stickers are a breeze to make, but off-the-shelf stickers can work beautifully to keep crafts like this accessible for anyone so that’s what we’ve used to create our customised treat jar for this DIY. There are plenty of off-the-shelf fonts and colours available to choose from to customise your jar in your own unique personal style. Stickers made of more durable materials, such as vinyl, foil, or other waterproof/resistant materials will hold up better to use and careful cleaning. Unlike customising your jar with glass paints, there is no mess or drying time involved. This is a very quick craft that is suitable for any skill level, including children who are able to safely handle stickers. Since “Oliver and Humphrey” (our dogs) is a whole lot of text to fit onto my cute little jar, I went with a simple “TREATS” for the demo shown in this post, but this would be also cute with pet names, nicknames, or other designs. For added embellishments, I bought long stickers for a wrap-around accent as well as little circles to create paw prints, all in similar gold metallic finishes to coordinate with my letters. Ensure that your jar is clean and dry, then apply your stickers to create your design. If you are applying letters in a straight line, a strip of masking tape can be helpful for alignment. If your jar isn’t round, applying from the middle letter outwards is an easy way to centre most text. If you are adding wrap-around embellishments, take care to ensure that any patterns line-up at the overlap points and try to position the overlap in an inconspicuous spot. Done! It’s really that simple! 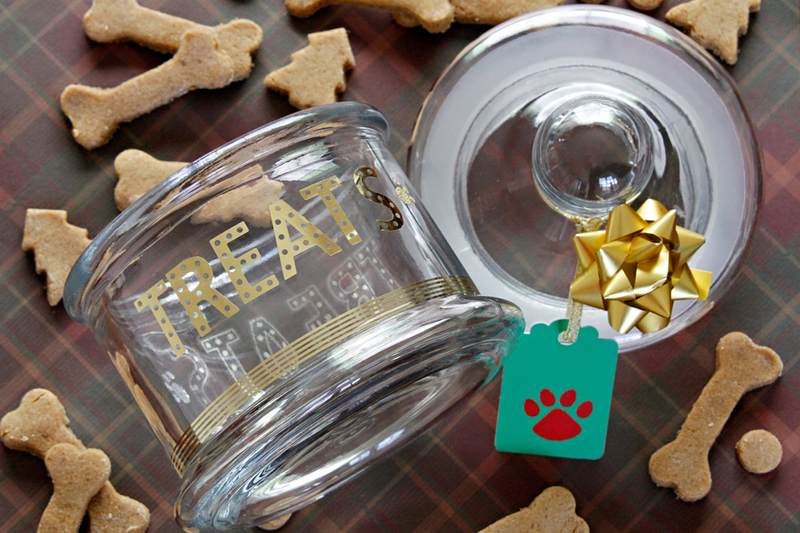 Enjoy using your pretty new treat jar, gift it to a friend, or make a whole batch of custom jars for holiday presents. Perfect! To make an extra special present, consider filling it with tasty treats or other goodies. If you are using pre-baked homemade treats, remember that they lack the preservatives of commercial treats will have a much shorter shelf life. Fill the jar when you’re ready to gift or mix things up by gifting the dry ingredients to a favourite treat recipe. Fun! If you’re looking for treat recipes or other doggone great ideas, come and visit my bio below and check my website. 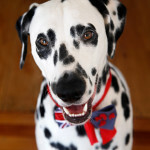 Oliver and Humphrey are two fun-loving Dalmatians enjoying the good life in New Zealand. Join us at Dalmatian DIY for dog-friendly DIYs, crafts, recipes, and more.